The post Dog Pooping Blood? Here’s What to Do Next by Jackie Brown appeared first on Dogster. Copying over entire articles infringes on copyright laws. You may not be aware of it, but all of these articles were assigned, contracted and paid for, so they aren’t considered public domain. However, we appreciate that you like the article and would love it if you continued sharing just the first paragraph of an article, then linking out to the rest of the piece on Dogster.com. Yikes! When you see something red in your dog’s poop, the first thing you think of is your dog pooping blood. But don’t panic. First, determine if the red you’re seeing is truly blood and read on for how to handle blood in dog stool. Think your dog is pooping blood? First, determine is anything red that you’re seeing is, in fact, blood. Photography by By Monika Wisniewska / Shutterstock. Almost nothing is more alarming than seeing something red in your dog’s poop. Depending on what that red color actually is, red poop can be serious or nothing to worry about. So, if your dog’s poop looks red, is your dog pooping blood — or could it be something else? “It can be caused by red coloring, like food coloring,” says Tracey Jensen, DVM, Dipl. ABVP, medical director at Wellington Veterinary Hospital in Wellington, Colorado. “It could be something that [your dog] ate that is simply innocently passing through. I once saw a dog that ate strawberry Chapstick, which came through.” If your dog eats red Crayons, they may also color the poop red. In general, food dyes that come from nontoxic sources will pass out in the stool and leave no lasting effects. If you see red in your dog’s stool — and you didn’t recently notice your dog eating a pile of red Crayons — call your veterinarian to make an appointment to have him checked out. If possible, bring a fresh sample of your dog’s stool for the vet to test. Blood in dog poop — could it be HGE or parvo? If it’s after hours and you see large amounts of bright-red, bloody diarrhea, especially if the diarrhea is accompanied by vomiting and/or lethargy (your dog is just lying around, clearly not feeling good), don’t wait until morning to contact a vet. Bright-red and bloody diarrhea may occur with an extremely serious condition called hemorrhagic gastroenteritis (HGE). Without treatment, dogs experiencing HGE can become extremely sick and even die. Additionally, young puppies with bloody diarrhea could potentially be suffering from canine parvovirus, a serious — sometimes fatal — viral disease. Seeing adult dogs with large volumes of bloody diarrhea, or puppies with bloody diarrhea, warrants a trip to an emergency clinic to be on the safe side. How do you treat a dog pooping blood? Treatment for a dog pooping blood is highly dependent on the cause of the bleeding. Once your vet is able to narrow down where the blood is coming from, he or she will be able to run some tests to determine the cause and select an appropriate treatment. The takeaway here? If you notice your dog pooping blood, don’t panic, but do have your dog examined by a veterinarian as quickly as possible. This is not something to wait out, since your dog might require quick and life-saving treatment. 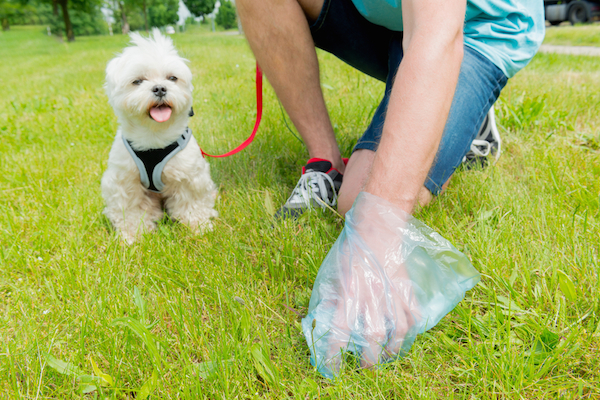 Tell us: Has your dog ever pooped anything red before? Was your dog pooping blood or something else? Thumbnail: Photography ©NUKUL2533 | iStock / Getty Images Plus.